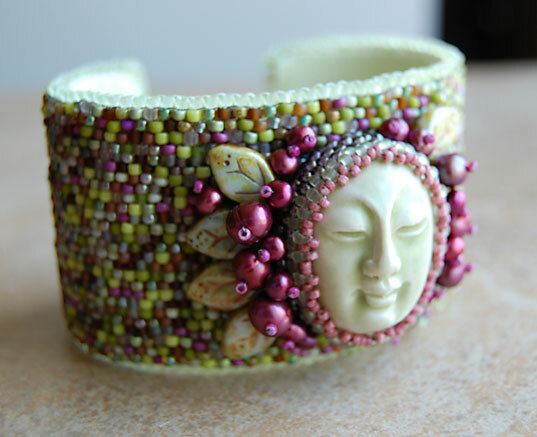 Spring colors are blooming on my very first bracelet cuff creation! Forsythia yellow, willow green, azalea pink, rhododendron rose, cream and baby pink magnolia. Colors so fresh and light, rebirthing the world in their embrace. Ah, I just love this time of year! Almost exactly 2 years ago, I wrote this post about stitching a 2-drop peyote band from a bead soup mix that was left over from this freeform bracelet. That band has sat, well, for 2 years now, on a bead mat in my studio, patiently waiting for me to transform it into a piece of jewelry. I created the face cabochon from polymer clay using the same glazing technique I used for these faces, rubbing on mica powder and mixing alcohol ink with liquid polymer clay. Aha! What if I sewed the peyote stitched band to a piece of ultrasuede and then glued that to a brass cuff? That would give it the weight and counterbalance it needed! So, I did just that and then glued another piece of ultrasuede to the back of the cuff. I stitched a beaded edge, thus joining the 2 pieces of ultrasuede together at their edges, giving the cuff a finished look. I found a great resource on the web for ultrasuede. Field’s Fabrics is located in Michigan, has over 160 colors of ultrasuede in stock and charges only a flat rate $6.00 for shipping. You can buy scrap variety packs or as little as 1/8 yard per color. I used a pale spring green called limade for this project. Even though it took me several years to figure out how to bring all of the components together in harmony, I’m so happy with my new creation. 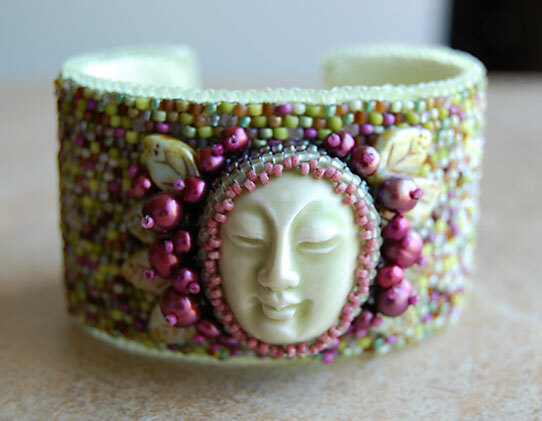 Now that’s it’s complete, I’m thinking of another bead embroidered bracelet, this one softer without the brass cuff, possibly beaded on a piece of batik fabric in yummy colors. Unless otherwise noted, all text and photos are the property of Karen Park Art and Tea, copyright 2007-2011. Please do not “lift” any of my photographs or blog posts for use on your blog or website. Thank you so much for your respect and kind attention. This entry was posted in Beads, Color, Creativity, Inspiration, Jewelry, mixed media, My Studio, Nature, Photography and tagged 2-drop peyote stitch, bead embroidery, beaded cabochon, bracelet, brass cuff, cuff bracelet, glass leaves, Jewelry, jewelry in spring colors, pearls, polymer clay face cabochon, seed beads, ultrasuede. What a stunning cuff! Your work is so wonderful! 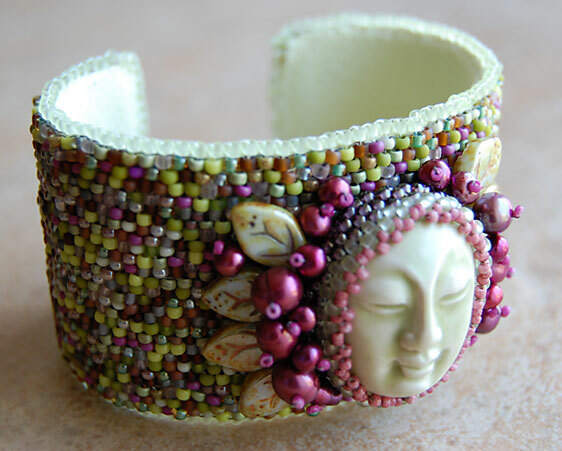 All the detail and colors, I love beaded things, but do not have the patience to do such fine detail work! Have a lovely day! It’s stunning, Karen ! And thanks for the tip on where to get Ultrasuede pieces……….the stuff is SO expensive ! Thanks Susan, you’re so kind! You have a lovely day, too. Karen, Karen, Karen… I must say it three times, because this is worthy of it. This is AMAZING. I am so in awe of your work and I’m not just saying that because we are friends. Really… stunning!!!! Love! That’s all, just love it. 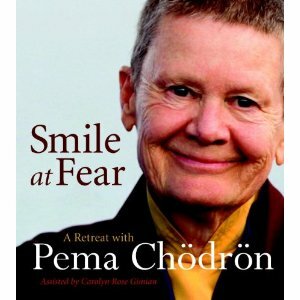 The face reminds me of Kuan Yin. Thanks so much, Amy! Yes, me, too.